I`m not sure what has gotten into my parents, but they have been very adventurous in the kitchen with their cooking. Let me brief you a bit. My mom cooks most of the dishes for dinner, while my dad helps out on his off day with a few veggie dishes. He would cook special dishes, like lobster noodles, once in awhile. It`s been this way for years. Lately, it`s like they`ve been bitten by a foodie-bug! (Possibly, from me? I`m hoping, hehe.) My dad started making various Chinese snacks, like Hong Kong Style Egg Waffle, coconut buns, steamed buns, and even sponge cakes. There was a period where he made this Vietnamese classic dessert, honeycomb cake (bánh bò nướng), which is a pandan coconut flavored cake, like ten times! I`ll admit that this isn`t their first time trying out new dishes. My parents` cooking reflects their upbringing. My mom`s cooking leans toward Vietnamese cuisine, while my dad`s come from a Chinese (Hong Kong) background. But, to get their daughters (aka me and my sisters) to be excited about their food, they`ll venture out occasionally. Years ago, when my sisters and I became obsessed with the Korean culture (music and dramas), my mom learned how to make japchae and soft tofu soup. This is one of the many reasons why she`s the best! :) So, I guess I can`t say that their adventurous sides came out of nowhere because I have seen it before. It`s just to a new extent this time! Now, they`re not just making entree dishes, but the snacks and desserts they`ve always bought for me when I was a child. Seeing as how I`m familiar with Western desserts though, I stuck with my specialty when I was brainstorming ideas on what to make for my mom. She`s not too keen on American desserts because they`re too sweet, but I didn`t want to ruin anything by baking something I wasn`t familiar with for Mother's Day. I just kept a mental note about it. 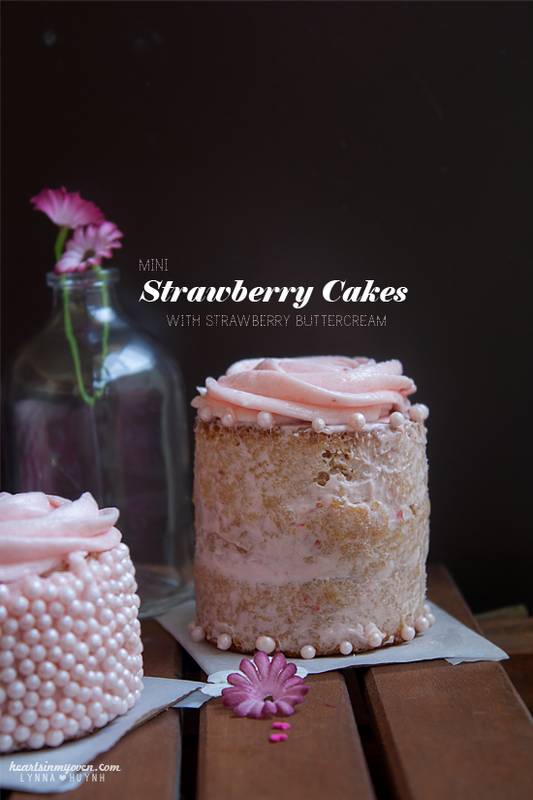 This strawberry cake uses real strawberries in the cake base and the buttercream frosting. When I baked the berry pound cake, she kept telling others how good it was, so I knew she would like this strawberry cake. It`s really light in texture. 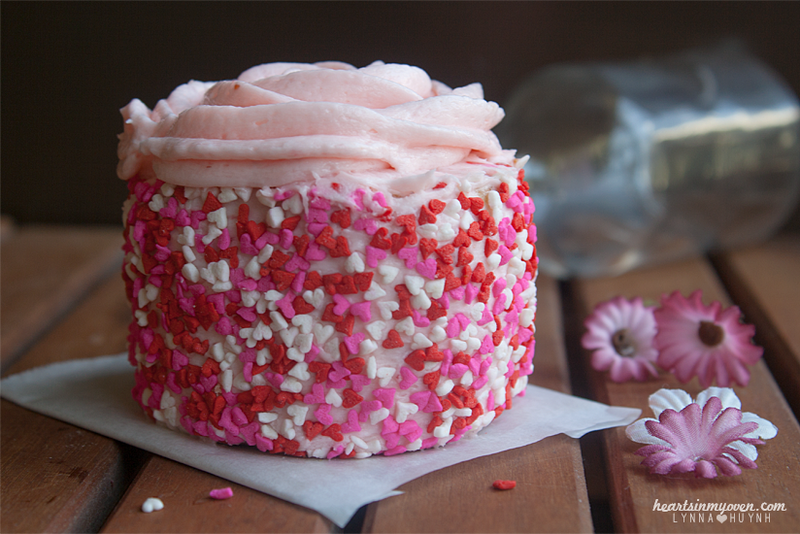 Without the frosting, it`s not too sweet, either. I barely frosted the cakes and made just enough to pipe roses on top. 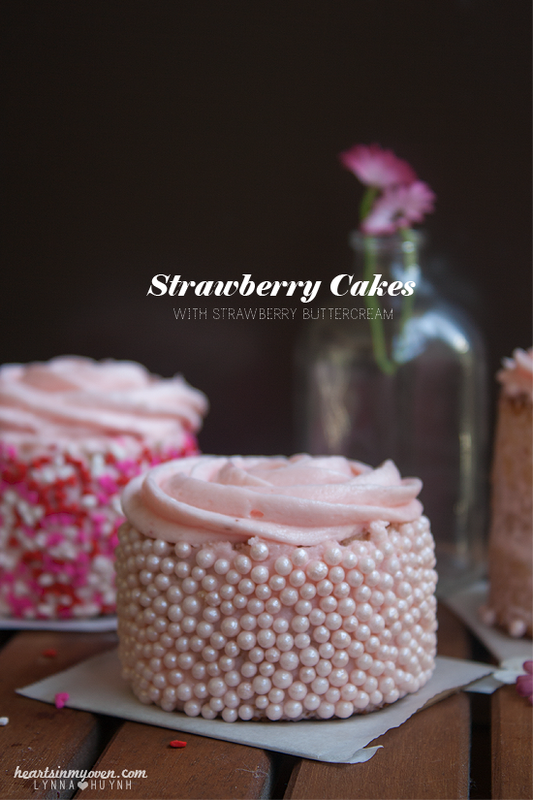 The cake has a very soft pink hue from the strawberries. I added 1 tiny drop of red food coloring, but I didn`t think it made much of a difference in the cake. 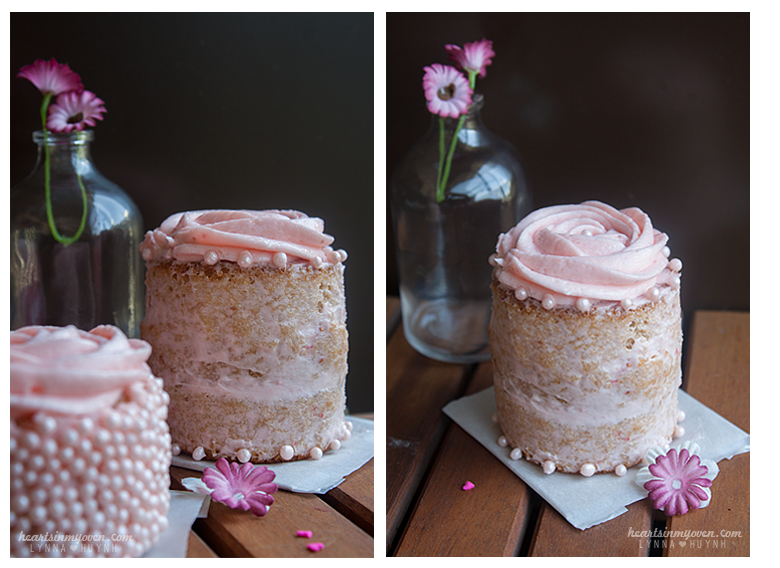 I opted for mini layered cakes, since I knew we couldn`t finish a whole layered cake. These mini cakes are the size of cupcakes. To get the straight edges, I baked the cakes in those standalone baking cups similar to these. I filled them almost to the top, then trimmed off the dome. I sliced each cake in half to get the layers. To assemble, I piped a thin circle of buttercream around the edge and filled the centers with lemon curd. Then, I topped it with another cake layer. Alternatively, you can bake this as one layer in a square baking dish and use a circle cookie cutter to get the layers. Or, just bake them as cupcakes! 1. Mash strawberries over a fine mesh sieve over a measuring cup. Use the back of a spoon to squeeze the juice out until you get ¼ cup. 2. In a food processor, puree the juice and mashed strawberries until smooth. 3. Pour mixture in a pan over low heat. Add a squeeze of lemon juice and stir occasionally. 4. Let mixture thicken. Once it's reduced down to about ¼ cup, remove from heat. Set aside. 5. Preheat oven to 350°F. Use cupcake liners or grease cupcake pan. 6. In a medium bowl, whisk together flour, baking powder, and salt. Set aside. 7. In a large bowl, with an electric mixer attachment and whisk attachment, whip your eggs on medium-high speed until foamy. 8. Gradually add the sugar. Continue whisking until it thickens and reaches the ribbon stage (when you lift the batter stays on top for a few seconds before disappearing). 9. Heat milk and butter in microwave to melt. Whisk to combine. Set aside. 10. Back to the eggs--add the dry ingredients to the eggs all at once. Mix until combined. 11. Next, take out about 1 cup of batter into another bowl. Whisk in your milk/butter mixture until incorporated. 12. Transfer everything back into the rest of the batter. 13. Add the vanilla extract and strawberry puree. Mix until combine. 14. Pour until cupcake molds. 15. Bake for 16-20 minutes, or until toothpick inserted in the center comes out clean. 16. In a bowl with paddle attachment, beat cream cheese until light and smooth. 17. Add the butter, salt, and lemon extract and beat on medium speed until fluffy (about 3 minutes). 18. Add the strawberry puree and beat until blended. 19. Gradually add in the powdered sugar until blended. Increase the speed to medium-high until buttercream is light and fluffy. - Cake will make 6 mini cakes & 4 cupcakes /or about 12 cupcakes/or one (8-9 inch) layer cake. 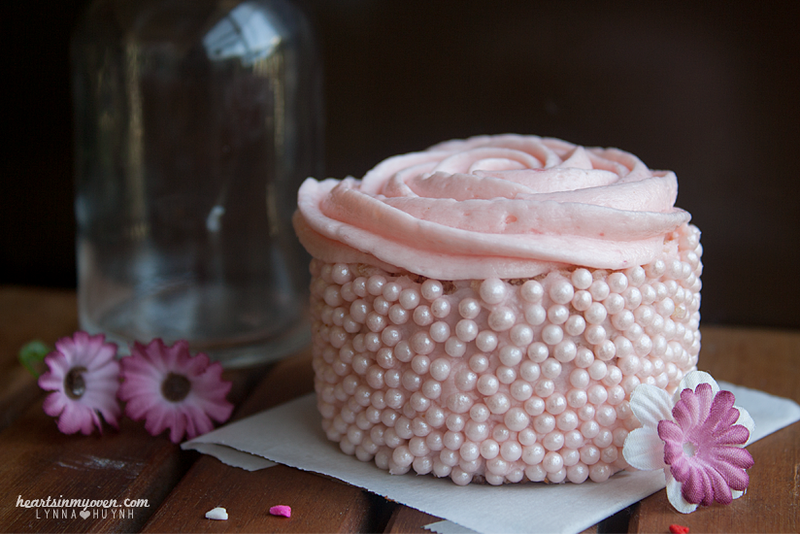 - To make mini cakes: bake cakes in standalone baking cups, like these and peel the wrapper off. Trim top and slice mini cakes in half to create the layers. For the layers: pipe a thin buttercream layer around the edge, fill center with lemon curd, then top with another layer. I added 1 drop of red food coloring in the cake and frosting, but you can omit this.